There’s quite a list of business to cover here. I’ll begin with the news that I just set up an account with Instagram! This will be a way to share spontaneous cellphone photos of projects I’m working on and things I encounter in my life that I find inspiring, from the everyday to the extra special. So, if you’d like to follow along, here’s my Instagram address. 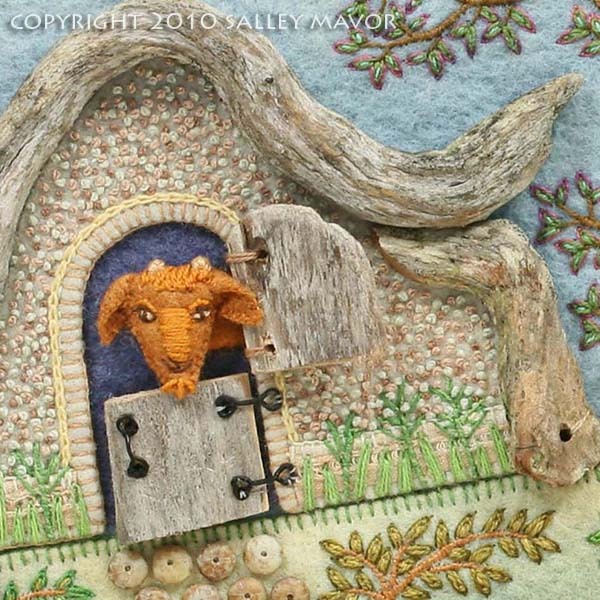 This little goat (detail above) and a donkey and swine from pages 6/7 in Pocketful of Posies (below) are on public display at the Concord Museum in Concord, MA. It’s included in the exhibit Good Night, Sleep Tight: Art from Children’s Literature, which features over twenty original illustrations from classic and contemporary children’s books woven around the themes of bedtime, dreams, and lullabies. The exhibit’s up for a nice long run, until May 3, 2015, but this coming Sunday Dec. 7th is Author and Illustrator Day (1:00 ~ 4:00 pm), which is held in conjunction with the annual exhibit, Family Trees: Celebration of Children’s Literature. I’ll be there, along with other authors and illustrators, chatting with museum visitors and signing books. There’s a lot going on at the museum that day, so, if you’re in the area, come over and say hi! A few years ago, I participated in the Concord Museum’s Family Trees event, which I wrote about here. 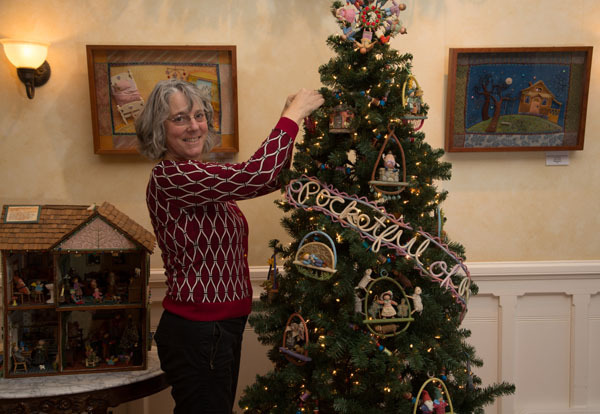 For the past two years, I’ve been using those same ornaments to decorate a tree for the Holidays at Highfield event at Highfield Hall in Falmouth, MA. My tree, as well as 6 original illustrations from Pocketful of Posies are downstairs in the front hall and my dollhouse is upstairs. 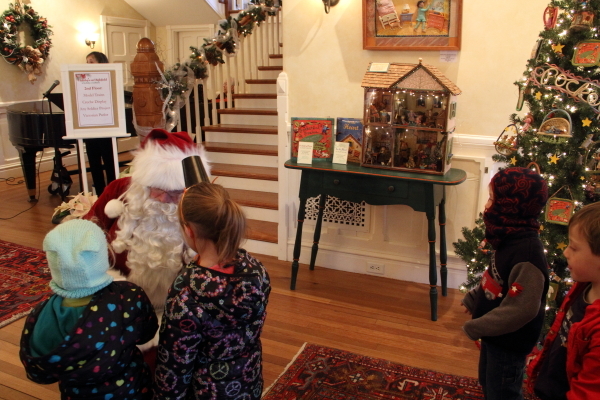 Holidays at Highfield is open daily from 10:00 to 4:00 until Dec. 7th. I spent the week playing with friends, both real and imaginary. 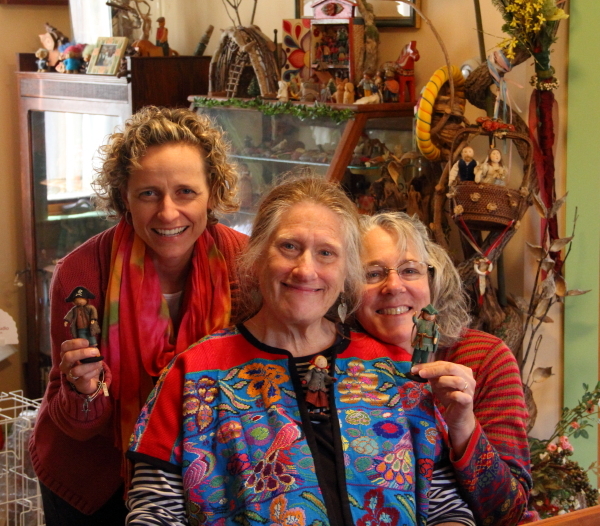 Judy Sue and April from Studio Goodwin-Sturges came to visit. It was so fun to have them over! Judy Sue and I go way back to my art school days, when she was my teacher at RISD. She is still inspiring and challenging students to find their own way of working. In fact, she makes a point that her classes are about “making art”, not illustration. She’s all about opening up possibilities! Hearing her talk excitedly about her current classes made me feel lucky to have had her guidance early on. The next part of the week was spent playing with dolls. 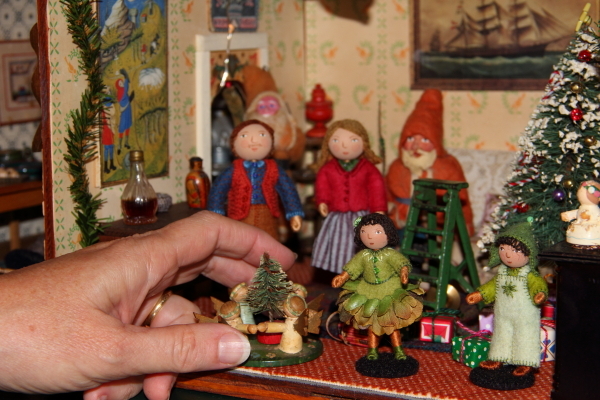 I set up my doll house and Pocketful of Posies Tree at Highfield Hall for their Holiday’s at Highfield event (Nov. 28 ~ Dec. 7). You can see more photos of the house in last year’s post here. 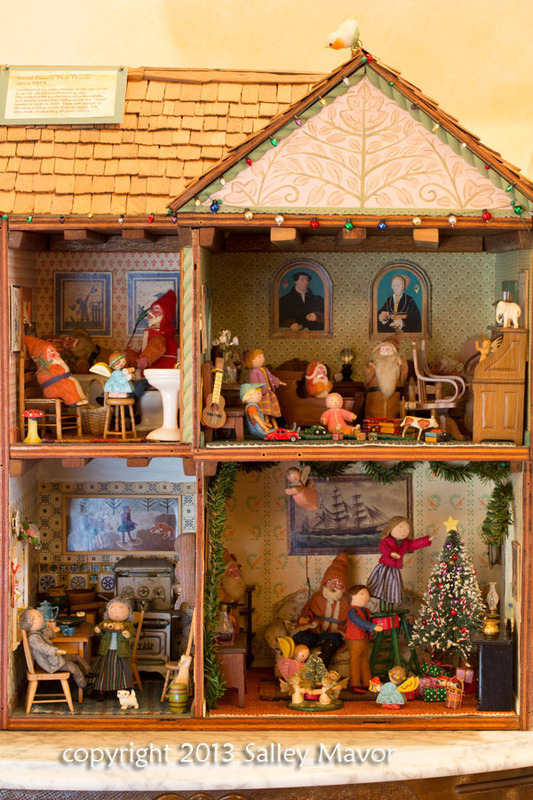 My doll house is inhabited by antique Santas and a family of dolls from my new book, Felt Wee Folk – New Adventures. I just found out that it’s release date is Feb. 16, 2015 and copies can be pre-ordered from C&T here. And, when the book is printed, I’ll be selling autographed copies (with an extra goody) through my Etsy Shop. This is the 3rd year I’ve decorated the Pocketful of Posies Tree and the 2nd year it’s been at Highfield for the holidays. 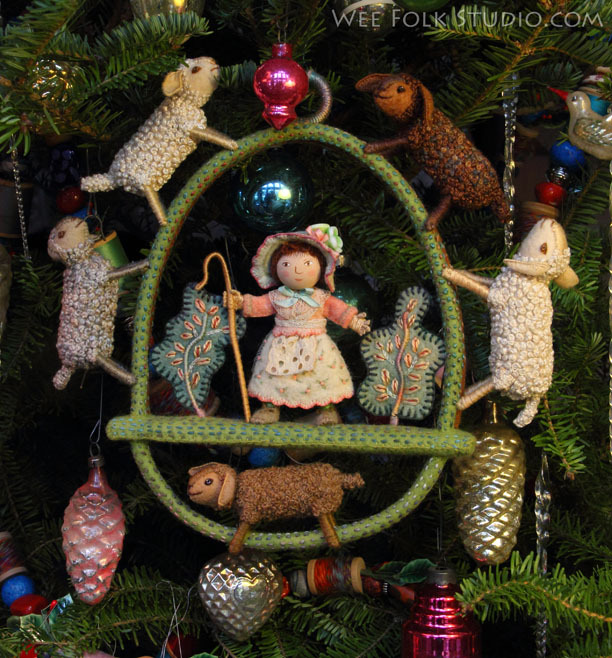 I’m always happy to unpack and hang the nursery rhyme ornaments and spool garlands. I hear that people who see the tree are disappointed that the ornaments are not for sale. But, I’d rather display them together as a group every year, in a place where lots of visitors can see them. If you’re local, come join the festivities at Highfield Hall! 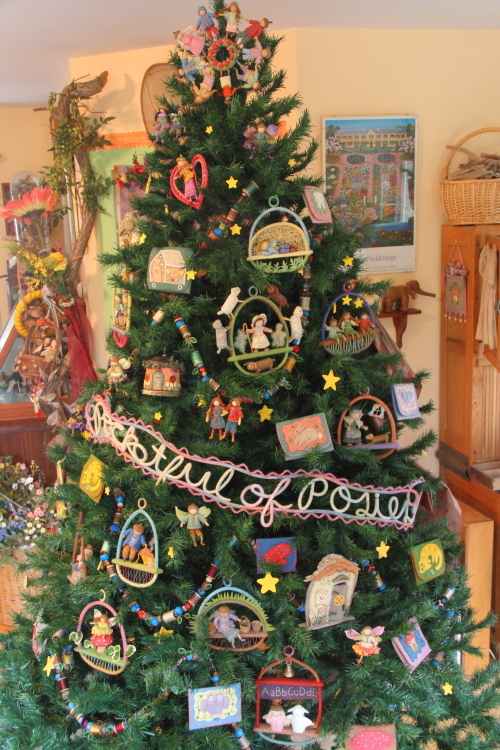 I am pleased to announce the the “Pocketful of Posies” tree has returned for another season–this year it is set up in the front entrance of Highfield Hall in Falmouth, MA. 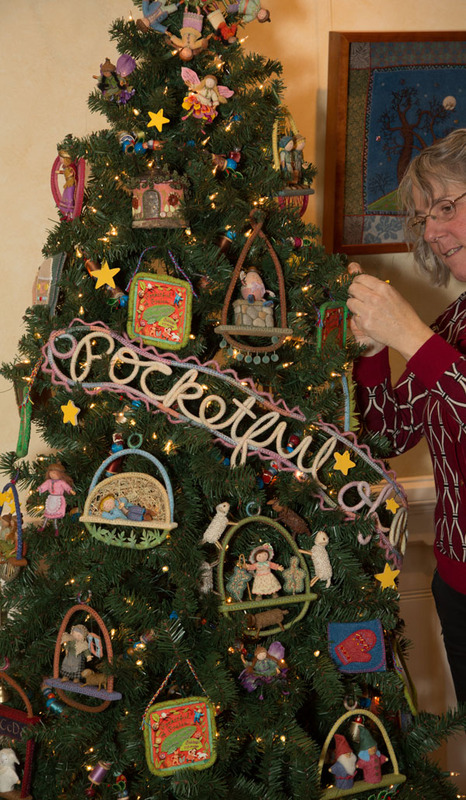 The tree, which is decorated with nursery rhyme themed ornaments/vignettes based on my book, Pocketful of Posies, will be on display during Holidays at Highfield (Nov. 29 – Dec. 8, noon ~ 4pm). 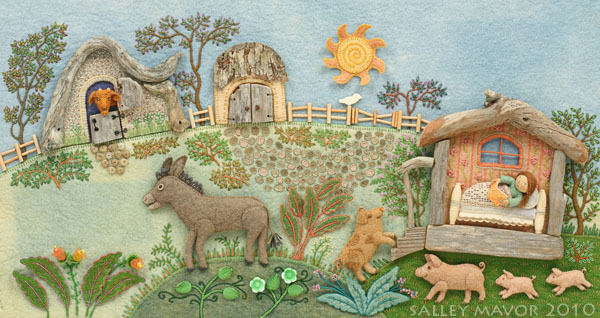 My dollhouse and 5 original fabric relief illustrations from my book, In the Heart are also on display. 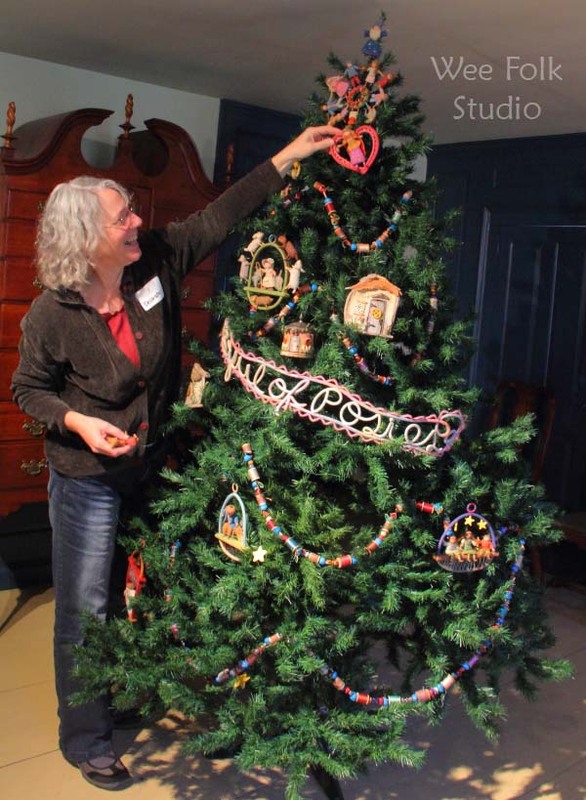 I made the ornaments for last year’s Family Trees event at the Concord Museum and I was happy to bring them back for this year’s event at Highfield Hall. 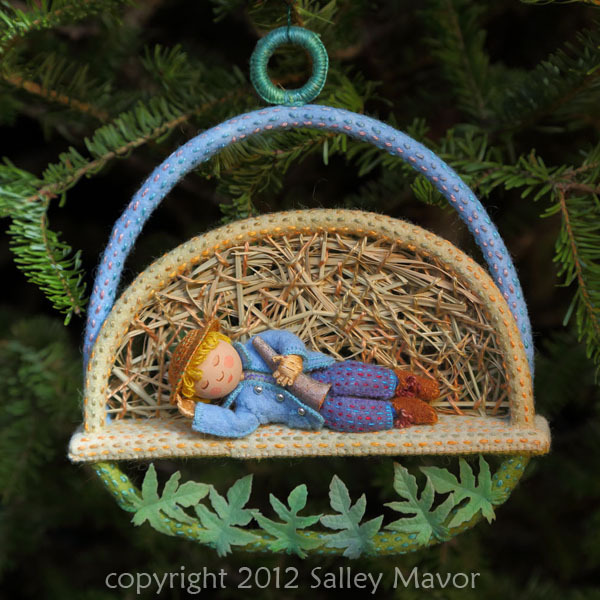 Here are closeups of some of the ornaments/vignettes. The 10 day event got off to a great start, with lots and lots of visitors stopping by Highfield on Friday. The building is beautifully decorated upstairs and downstairs. I feel honored to be a part of such a fun and lively event! Before we leave on our trip, I want to show more pictures of my Pocketful of Posies tree. 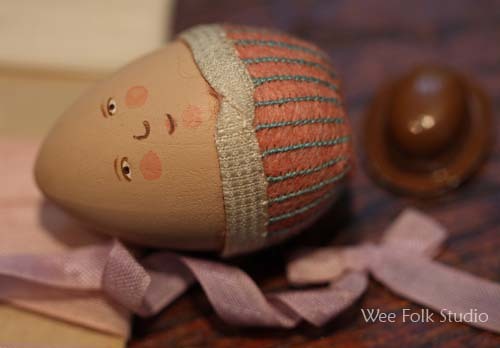 The basic instructions for making dolls similar to these are in my how-to book Felt Wee Folk. To see these ornaments in person, visit the Family Trees event at the Concord Museum, which will continue until January 1st, 2013. Time is limited, so I’m just going to post pictures. 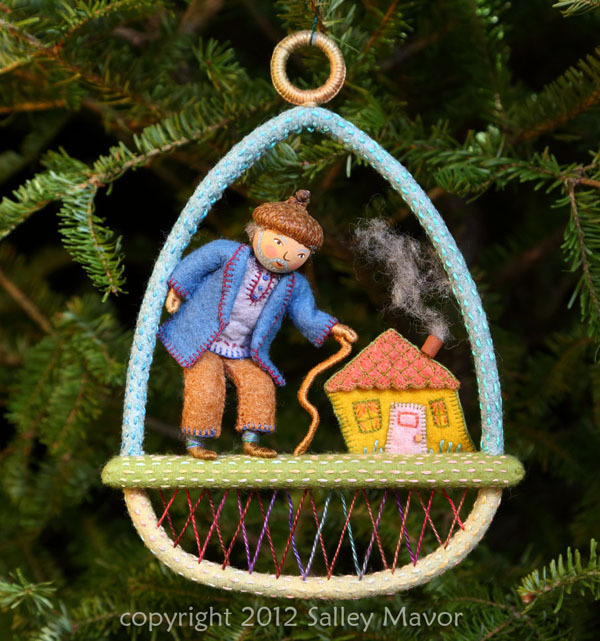 Can you guess which nursery rhymes are depicted in the individual ornaments? 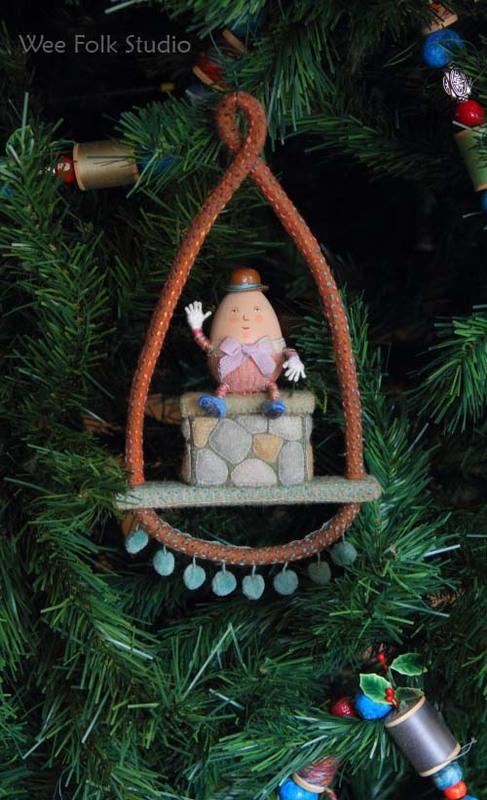 Humpty Dumpty sat on a wall…in a Christmas tree? 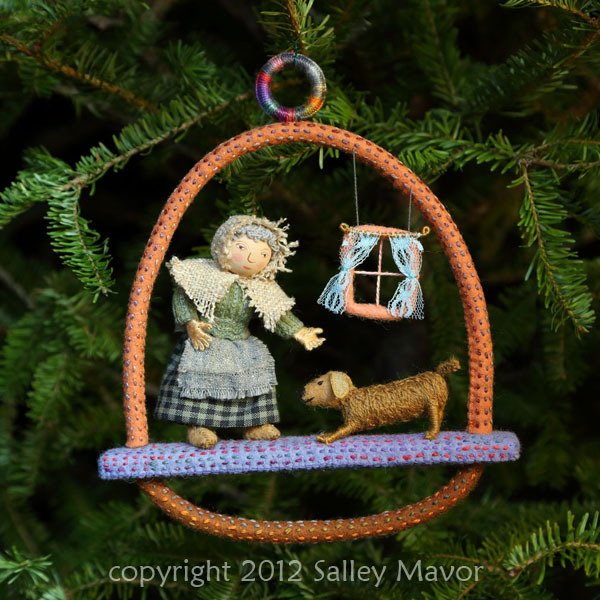 This was one of the first ornaments I made for the Family Trees event at the Concord Museum. And, it is one of the few that I remembered to photograph during the process. 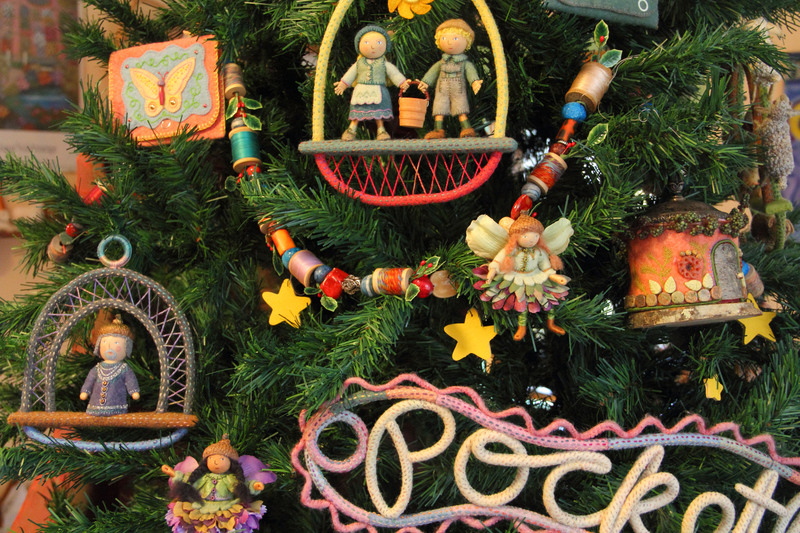 The tree is covered with decorations based on my picture book Pocketful of Posies: A Treasury of Nursery Rhymes. 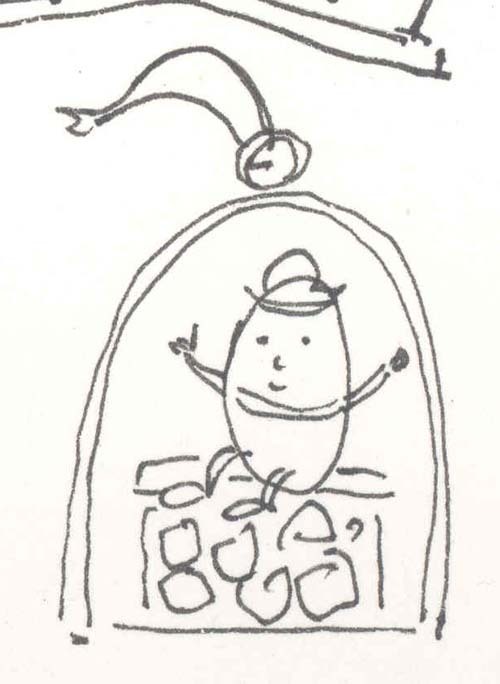 This sketch of Humpty Dumpty is originally about 1 inch tall. While working on it, I figured out how to make a wooden shelf for the wall to sit on. Every thing is covered in stitched felt, including the wood shelf, wall and the teardrop shaped wire frame. 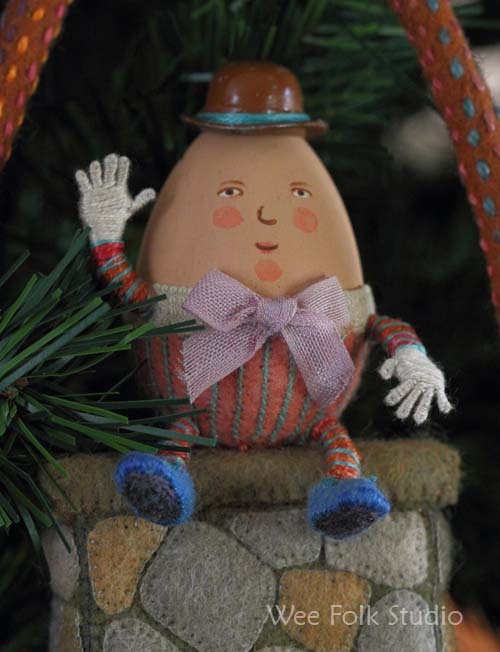 I bought an egg sized wooden egg at a craft store, painted it and dressed the round body in embroidered striped felt “pants”. A white belt made of antique trim finished off the waste band. I drilled holes for the arms and legs and wrapped the wire hands and pipe cleaner limbs with thread. A bow tie seemed appropriate for this dandy! 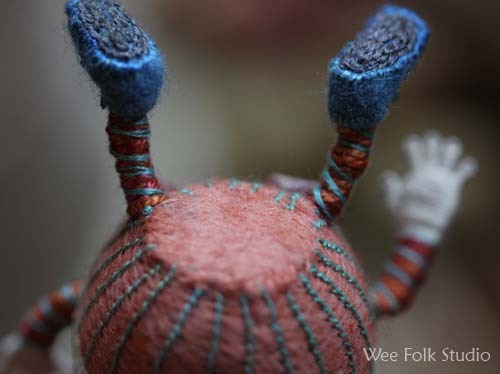 I sewed some wee felt shoes onto his feet, with chain-stitched soles. I’ve had the little brown metal bowler for ages and decided it would be a perfect hat for Humpty. White glue holds it aloft his pointy head. I made the stone wall from an appliqued felt covered piece of wood. 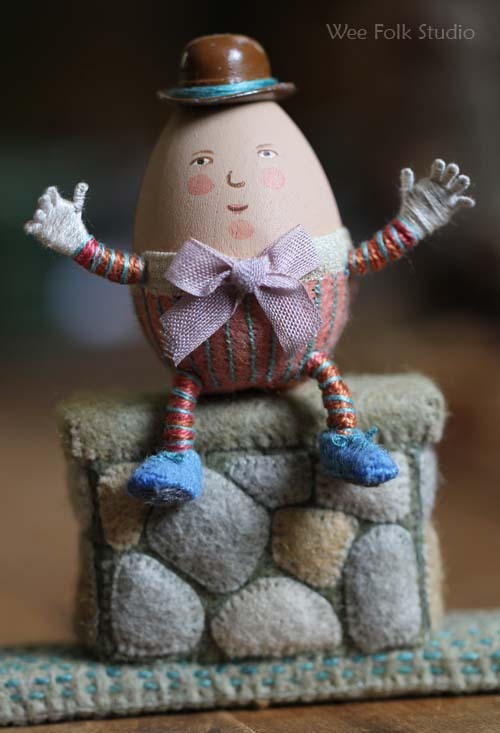 Humpty Dumpty waves cheerfully from his stone perch, unaware of his impending fall! 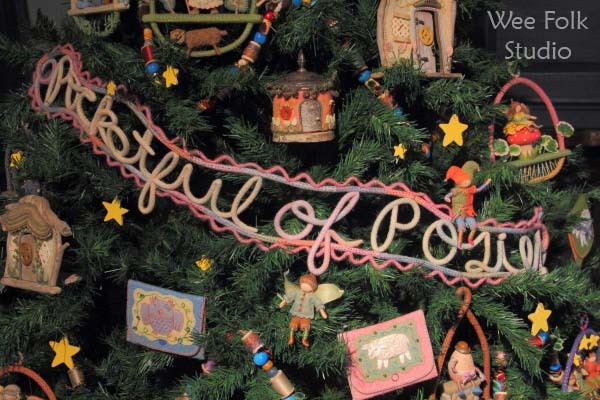 See all of the posts about the Pocketful of Posies tree here. 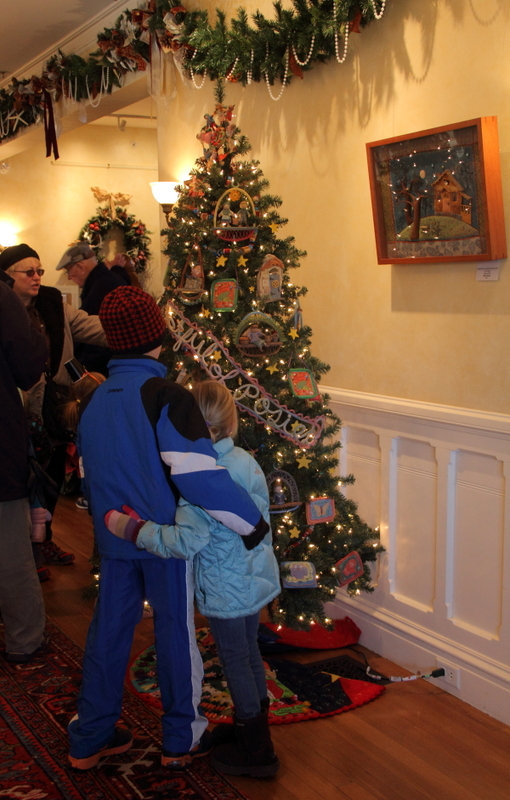 A total of 38 decorated trees inspired by classic and contemporary children’s books are on display at the Concord Museum until January 1, 2013. This is what the Pocketful of Posies tree looked like in my studio before it was taken all apart and transported to its next destination, the Family Trees exhibit at the Concord Museum in Concord MA. 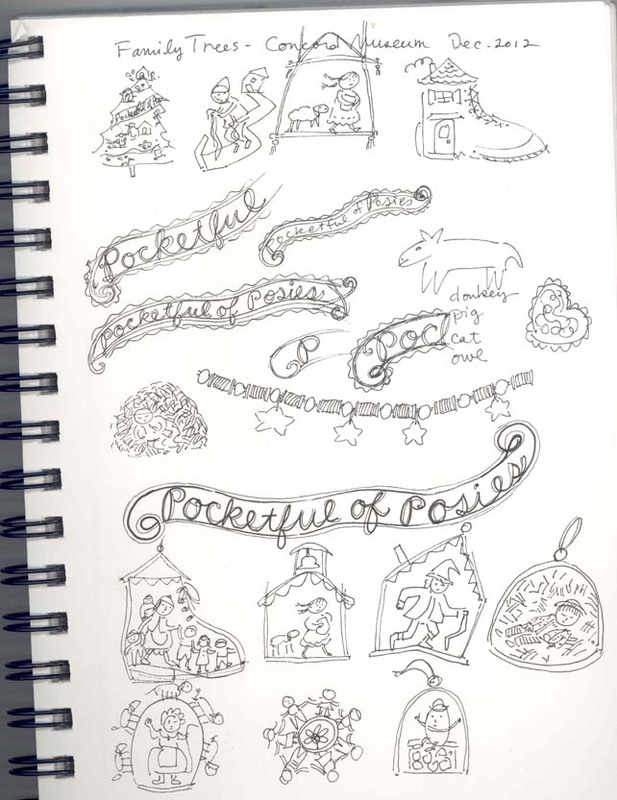 See blog posts about making the Posies book here. On Monday, I drove up to Concord, through morning rush hour traffic on Rt. 128 with my Subaru full of artificial tree limbs and Pocketful of Posies felt ornaments. By the time I arrived at the Concord Museum, dozens of volunteers were already setting up their trees for the Family Trees exhibit. 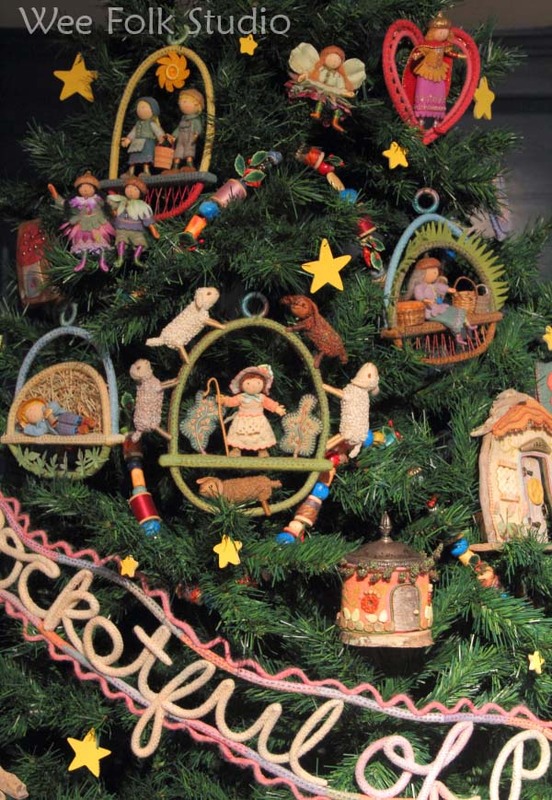 There will be over 30 decorated trees throughout the museum, all based on classic and new children’s books. The museum describes itself as the gateway to Concord’s remarkable revolutionary history. I was led through a maze of narrow, winding hallways, past the Emerson Room and the Thoreau Room, to my assigned location, the blue room. 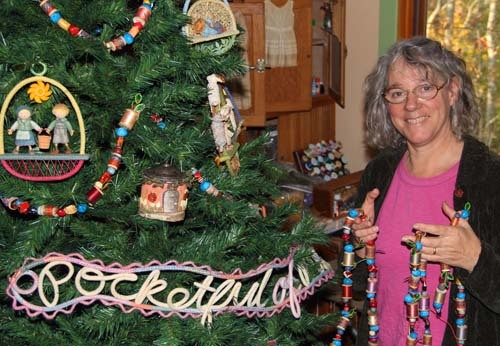 I got right to work, assembling the tree and hanging the larger parts, including the thread spool garlands and felt-covered wire book title. A volunteer was nice enough to take my picture during the process. Below is a page from my sketch book from last spring, when I started jotting down ideas for the tree. I wanted to make vignettes, that would act as hanging stages for the different nursery rhymes. 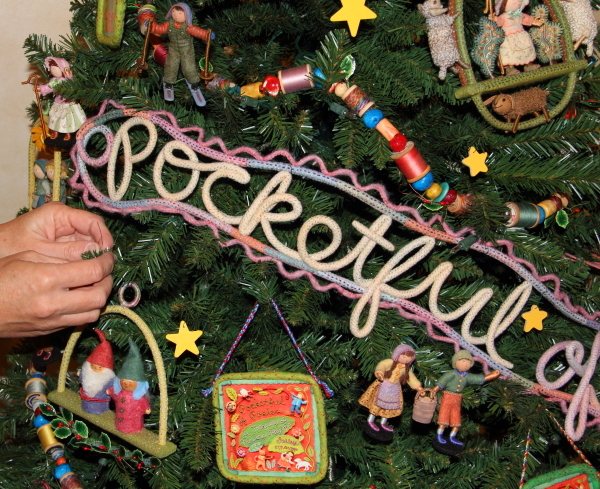 I hung dolls and felt purses that I had made years earlier, too. 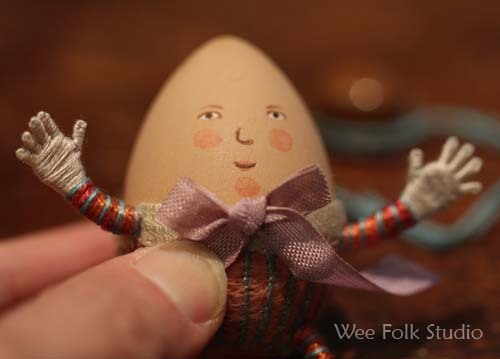 Some were sample projects from my how-to book, Felt Wee Folk. I also scattered yellow painted wooden stars around the tree. Many other tree decorators came by to see what I was doing. They couldn’t believe that I had made everything by hand. One woman asked, “Are you crazy?” To tell the truth, I think working this way prevents me from going crazy. I really like the way the tree looks in the blue room with the antique furnishings and bright museum lighting. It also has a security fence, so I don’t have to worry about ornaments walking away. If you live in the Boston area, go see this exhibit! It opened on Nov. 21st and will run through January 1, 2013. All ages will enjoy a visit to Family Trees this holiday season (it’s held every year). If you want to see more about the tree on my blog, stay tuned, because I’ll be writing several posts, with close-ups of the individual ornaments. 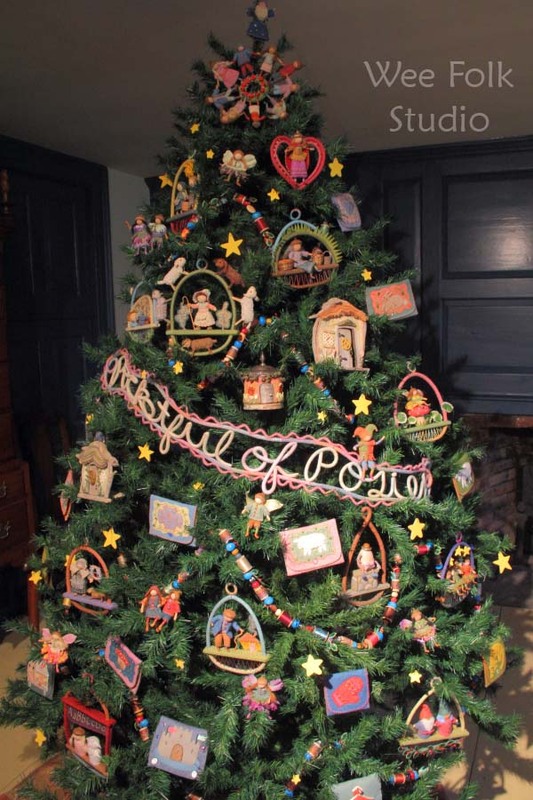 I’ve just about finished decorating the Pocketful of Posies tree for Family Trees: A Celebration of Children’s Literature at the Concord Museum. Early Monday morning, I’m driving everything up to Concord, the day after my Open Studio, which you can find out about here. I have to remove my decorations and take the tree apart on Sunday night and reassemble it again in the museum. There will be over 30 trees set up around the museum, all representing different children’s books. All of the trees, except for mine and another illustrator’s, are being decorated by museum volunteers, who have been preparing for months. So the museum will be swarming with industrious volunteers. They’ve promised lunch for us all! 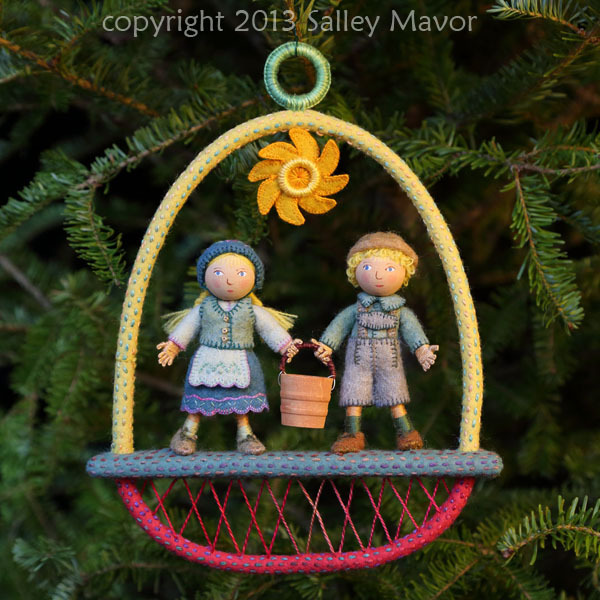 My tree is dotted with little vignettes that serve as stages for the nursery rhyme doll characters. I added a garland strung with old wooden thread spools and beads. I used some J&P Coats and Star brand cotton thread that my grandmother had about 50 years ago. 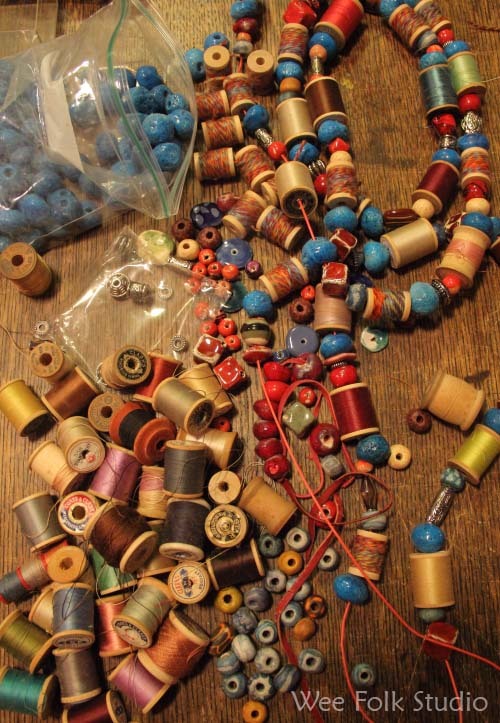 To supplement my supply, I bought some empty wooden spools and wound them with yarn. 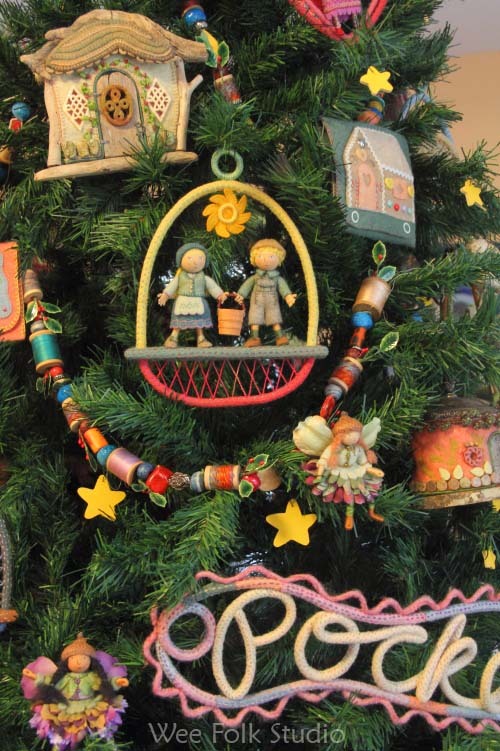 Hung in loops on the tree, the spool garland breaks up the space, almost like doodles in a notebook. Also, please visit my new Facebook page, which you can get to by clicking the orange “F” button in the right hand column of the blog’s home page.